Cardiovascular diseases (CVDs) are the number one cause of death globally: more people die annually from CVDs than from any other cause . In particular, in industrialized countries CVDs are currently the leading cause of death and are expected to become so in emerging countries by 2020 . The number of people who die worldwide from CVDs, mainly from heart disease and stroke, are expected to increase to reach 23.3 million by 2030 [1-3]. CVDs are projected to remain the single leading cause of death. An estimated 17.3 million people died from CVDs in 2008, representing 30% of all global deaths. Of these deaths, an estimated 7.3 million were due to coronary artery disease accounting for 12.8% of all deaths . Coronary artery disease (CAD) is the most prevalent manifestation and is associated with high mortality and morbidity. Worldwide, CAD is the single most frequent cause of death. The clinical presentations of CAD include sudden death, silent ischemia, stable angina pectoris, unstable angina, heart failure and myocardial infarction (MI). Registry data over a 10-year-period (1999–2008) show that NSTEMI accounts for approximately 2/3 of MI, STEMI for 1/3 . Also, men consistently are affected more frequently than women. The annual incidence of MI varies between countries and between registries [7, 8]. An average estimate number is 3-4 MI per 1000 inhabitants. Accordingly, the rates of fatal MI range from 9%-18%  with a higher number of fatal events during hospitalization in patients with STEMI (7% compared to 3-5% for NSTEMI) . However, the mortality rates are very similar in both conditions in a follow-up at 6 months (12% and 13%, respectively) [7 – 10]. Clinically and pathophysiologically, MI represents a life-threatening manifestation of atherosclerosis. A coronary artery plaque is ruptured or eroded and a clot is formed by the release of substances from the ruptured clot causing an occlusion of the coronary artery. 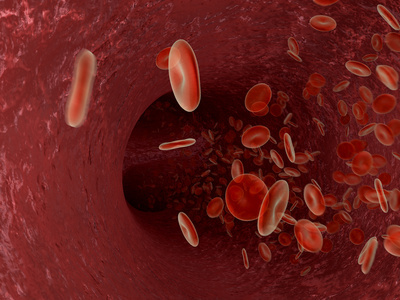 Blood flow delivering vital oxygen and nutrients to myocardial cells supplied by the affected coronary artery is dramatically reduced or even stopped – a condition which finally leads to the death of the heart muscle cells. Acute AMI mortality has significantly decreased in the last 2 decades leading to more chronic survivors of AMI. Since myocardial/heart tissue has been lost many patients surviving an AMI develop slowly over time chronic heart failure. Reduction of the acute AMI mortality this results in an increase of heart failure. Regenerative therapy aims at preventing this slowly developing heart failure by ameliorating the ischemic loss of myocardial tissue. 2. Murray CJ, Lopez AD. Alternative projections of mortality and disability by cause 1990–2020: Global Burden of Disease Study. Lancet 1997;349: 1498–1504. 3. Mathers CD, Loncar D. Projections of global mortality and burden of disease from 2002 to 2030. PLoS Med, 2006, 3(11):e442. 4. Thygesen K, Alpert JS, White HD. Universal definition of myocardial infarction. Eur Heart J 2007; 28:2525–2538. 7. Yeh RW, Sidney S, Chandra M, Sorel M, Selby JV, Go AS. Population trends in the incidence and outcomes of acute myocardial infarction. N Engl J Med 2010; 362:2155–2165. 9. Savonitto S, et al. Prognostic value of the admission electrocardiogram in acute coronary syndromes. JAMA 1999;281:707–713. 10. Mandelzweig L, et al. The second Euro Heart Survey on acute coronary syndromes: characteristics, treatment, and outcome of patients with ACS in Europe and the Mediterranean Basin in 2004. Eur Heart J 2006;27:2285–2293.